Squished into your economy seat 35,000 feet over Toledo, it's hard to picture yourself sauntering down the aisle to a lounge the size of your living room, plopping down into an overstuffed chair and listening to someone batting out your favorite tunes on a Wurlitzer piano -- and all in coach. Squished into your economy seat 35,000 feet over Toledo, it's hard to picture yourself sauntering down the aisle to a lounge the size of your living room, plopping down into an overstuffed chair and listening to someone batting out your favorite tunes on a Wurlitzer piano -- and all in coach. On other planes, instead of using seat-lock gadgets to defend your tiny turf against incursions by the guy in front of you, passengers could relax in what amounted to flying taverns with wine-tasting parties and entertainment by guitarists and caricature artists -- again, all in coach. 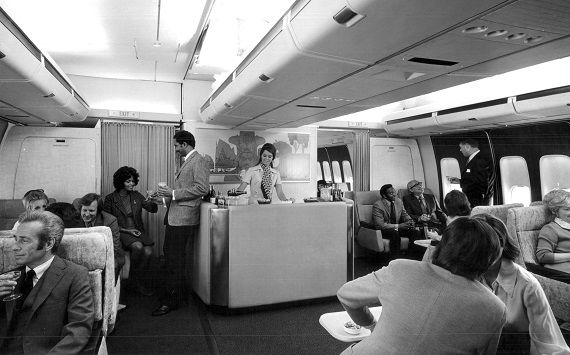 One of two coach lounges on a United 747 in 1971. Photo courtesy of United Airlines. Business was booming and airline traffic forecasts looked rosy in the mid-'60s when the carriers ordered their first jumbo jets, some twice the size of their workhorse Boeing 707s. But five years later when the big Boeing 747s and McDonnell Douglas DC-10s started rolling off the production lines, a severe recession was gripping the nation -- and the airlines had fewer bottoms to put in all those added seats. Clobbered by the awful economy, the airlines' load factors (the percentage of seats filled) fell to incredibly low lows of under 50 percent. Things got so bad that air crews sometimes found themselves outnumbering their passengers. So the airlines decided to boost their headcounts by giving the folks in coach a taste of the perks enjoyed by the silky set in first class. The competitive frenzy that followed came to be known as "The Great Lounge War." American Airlines fired the opening salvo in April of 1971 by ripping out 40 of the 270 coach seats in its new 747s to make room for a wall-to-wall coach lounge and to stretch out the legroom on the remaining seats. American's PR blitz billed the lounge, featuring a standup bar, plush armchairs and cocktail tables, as "the ultimate in informal conviviality in the skies." United Airlines cut loose with a double-barreled counterattack by ridding its 747s of enough seats to install not one but two coach playrooms. They were said to offer "a club-like atmosphere, styled with standup bars, swivel lounge chairs and double-leisure chairs flanking multi-purpose tables." A TWA coach 'living room' in 1971. Photo courtesy of TWA. TWA -- the third of the era's "big three" airlines -- jumped into the fray with this policy statement from company executive Blaine Cooke: "We will not be outsold or outspent in this top-priority effort." 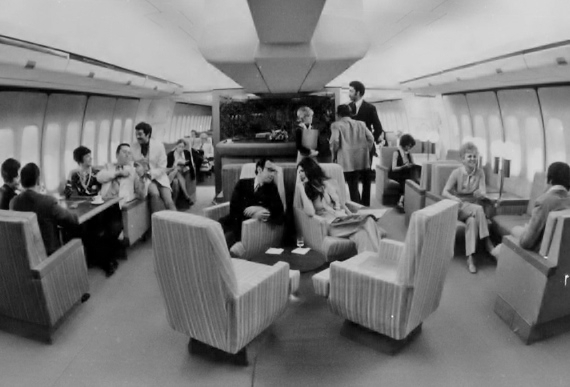 Besides creating "a unique living room" on its 747s, complete with a seven-foot-long bar and clustered seating around cocktail tables, TWA went on to put scaled down versions of the lounge on its fleet of 41 smaller 707s. TWA touted its munificence as "the most dramatic service innovation in jet history." American fired back with this bombshell: the in-flight piano bar. Escalating the battle to fever pitch, American Vice President Kenneth L. Meinen added amplified 64-key Wurlitzers to the carrier's lounge attractions aimed at "making an event of every flight." By December of 1971, passengers were merrily singing piano-led songs like Let it Be and Joy to the World as they zipped through the skies on all 16 of the airline's 747s. 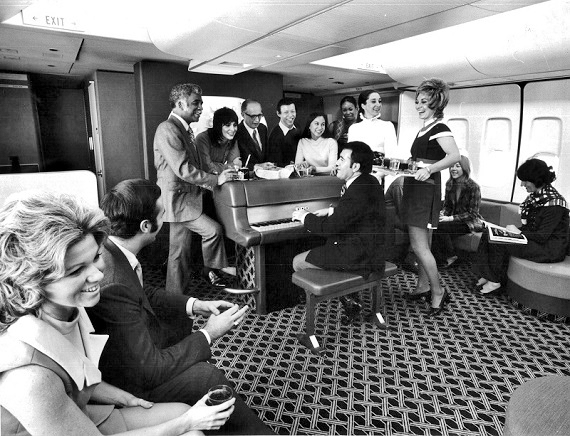 Coach piano bar on an American 747 in 1971. Photo courtesy of American Airlines. By the time the airlines agreed to a cease-fire in 1972, seats had been ripped out to make room for coach lounges on the 747s of most carriers as well as on their new DC-10 tri-jets (Lockheed's jumbo, the L-1011, came along a little later). What's more, United had begun treating its passengers to a menu of aerial fun and games tagged "in-flight happenings" featuring lounge acts such as guitar fests, caricature portrait sessions and wine tasting parties. With the armistice, prompted in large part by an improving economy, came a return to the cramped old days as all those missing seats reappeared to displace the lounges. Further speeding the playrooms' demise was the world oil shortage of 1973, which led to fuel rationing for the airlines along with government-ordered flight cutbacks -- putting airline seats at a premium, particularly on the jumbo jets. Today, with airline load factors soaring as high as the '90s, all those perks of the Great Lounge War are just a distant memory.